The U.S. Supreme Court decision on the student strip search case was announced today. The ACLU , who represented April Redding, the mother of the Arizona student, Savana Redding, calls it the first victory for student rights in the last twenty years. The High Court ruled that the search that took place when honors student Savana was 13 years old was an unconstitutional violation of her rights. The search was done by school officials on the basis of an uncollaborated accusation by another student that Savanna had ibuprofen in her prosession. Now nineteen years old, Savanna wrote about her experience and her court victory on the ACLU blog today. "People of all ages expect to have the right to privacy in their homes, belongings, and most importantly, their persons. But for far too long, students have been losing these rights the moment they step foot onto public school property -- a lesson I learned firsthand when I was strip-searched by school officials just because another student who was in trouble pointed the finger at me. I do not believe that school officials should be allowed to strip-search kids in school, ever. And though the U.S. Supreme Court did not go quite so far, it did rule that my constitutional rights were violated when I was strip-searched based on nothing more than a classmate's uncorroborated accusation that I had given her ibuprofen. I'm happy for the decision and hope it helps make sure that no other kids will have to experience what I went through. "Strip searches are a traumatic intrusion of privacy. Forcing children to remove their clothes for bodily inspection is not a tool that school officials should have at their disposal. Yet, until today, the law was apparently unclear, potentially allowing for the most invasive of searches based on the least of suspicions. Every day, parents caution their children about the importance of not talking to strangers, looking both ways before crossing the street, and following directions at school. But I imagine they never think to warn them that a school official, acting on a hunch, may force them to take their clothes off in the name of safety. And now, thankfully, they won't have to. "Our fundamental rights are only as strong as the next generation believes them to be, and I am humbled to have had a part in preserving and promoting the Fourth Amendment to the Bill of Rights." Readers can read the U.S. Supreme Court decision here. Editor: The journal recently published some articles on another student rights case, Morse v. Frederick, decided by the U.S Supreme Court in 2007. Readers can read two articles on that case in our journal's Winter 2008 issue on "Schooling as if Democracy Matters. We have just put up a post on the Journal of Educational Controversy Blog about our newly formed Educational Institute for Democratic Renewal. We are anxious to get ideas and feedback. Check it out. Liz Coleman of Bennington College calls for us to reinvent liberal arts education in a recently posted TED talk. This talk documents the way "expertise" has overthrown the generalist, "with increasing emphasis on the technical and obscure." She disses postmodern deconstructionism in literature, which I find unnecessary and a bit unintellectual, but she makes a good case for something that many of us already know: that higher education institutions have no clear sense of the democratic purposes of education. She says that despite the explosion of community service programs on campuses, these remain strictly outside the curriculum, and the current civic engagement push is oversimplified and does not disturb, ultimately, the basic neutral and expert stance that characterizes the academy's curriculum. Higher education (her focus) no longer provides the capacity for deep civic engagement, she argues. We are "playing with fire in terms of our responsibilities for the health of this democracy," she states. While some of her points are a bit overstated, and "education for education's sake" seems to be utterly dismissed, I think her basic point is right on. It is exactly the stance that makes folks like Stanley Fish crazy. The fifth annual Community as Intellectual Space Symposium will be held on June 12-14 at La Estancia on 2753 W. Division Street, Paseo Boricua, Chicago, Illinois. The theme of the symposium is Critical Pedagogy: Community Building as Curriculum. As professionals and institutions are engaging with communities to enhance the life chances and well-being of residents, the conference examines how community-building and critical pedagogy can offer effective and sustainable change, locally and among collaborators as well. Community Archiving and Web 2.0 Cataloging. The conference also offers Batey Urbano's production of Crime against Humanity, screenings of original documentaries filmed on Paseo Boricua, community tours, and art exhibits. 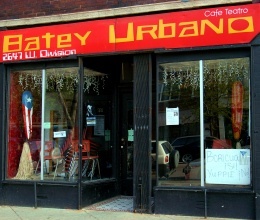 Community as Intellectual Space is co-organized by the Juan Antonio Corretjer Puerto Rican Cultural Center (Chicago) and the University of Illinois Graduate School of Library and Information Science. Continuing Professional Development Units (CDPUs), academic course credit for those who enroll in UI's LIS590 CIO, and registration scholarships available.